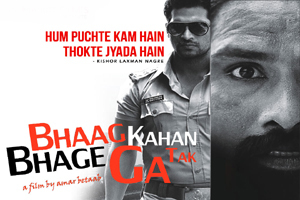 Bhaag Kahan Tak Bhagega is a 2016 Hindi language crime thriller film directed by Amar Betaab, and produced by Salma N. R. and Soloman N. R. The film stars Nafe Khan, Annu Kashyap, Solomon N. R. , Wilson Tiger. The soundtrack of Bhaag Kahan Tak Bhagega is composed by S P Sen, Anwar Hussain II, Baba Jagirdar and Shikandar Shah, with lyrics written by S P Sen, Ambar Azmi, Shridhar Kamble, Suneel Sagar, Rameshwar Sharma. Here is the link of all the songs lyrics and videos of Bhaag Kahan Tak Bhagega.